August | 2017 | Explorations in Spirit with Dr. Joseph Mancini, Jr. The Present Power of Past Lives: The Experts Speak. It is now available on Amazon! In late 2013, I conducted a series of radio interviews on globally-based VoiceAmerica with experts in the field of past lives, past-life regression, and the expansion of consciousness. Based on those interviews and with additional materials, my book starts with my practices and tips for helping a client achieve a successful past-life regression and finding an appropriate regressionist. After I interview three of my clients about the healing that past-life regression can provide, I discuss what Karma is and is not. In contrast to a time-bound, cause-and-effect mechanism that tends to focus on what amounts to predetermined punishment for transgressions committed earlier in the present or in a past life, I see a pattern of freely-chosen contracts/choices made with others to try out a different path. Following the chapter on Karma are ten other chapters devoted to the different contexts in which practitioners have accessed past lives. See the Table of Contents below. Through the text and Endnotes, I comment on what is presented in the interviews from the point of view of Seth, that “energy personality essence” channeled by Jane Roberts from 1963 to her death in 1984. Making this perspective even more concrete are the interviews with two of Jane’s ESP students, Rich Kendall and the late Lawrence Davidson, who share what it was like to have Seth comment on several of their own past lives. This book will appeal greatly to followers of Seth, those interested in the expansion of consciousness, those curious about past lives and related matters, and novice and experienced practitioners of past-life regression. I hope you will purchase and read the book and, if you like it, write a review of the book on Amazon. Seekers of expanded consciousness will revel in Dr. Joe Mancini’s compilation of cutting-edge work and key practitioners in the field today. As a talk show host, he takes the reader on a journey into other dimensions that offer new ways not only of healing ourselves, but also of recharging and reconfiguring our minds, hearts, physicality and spirituality. He dares to lead us into our own natal experiences, past lives and life between lives. He explores the Seth Material’s perspective on Karma, time and space and leaves the reader empowered with choice. This is a powerful book for novices and professionals alike! —Barbara Lane, Ph.D., CHt., is a past-life researcher and has regressed thousands (of people). Her work has been featured on TV, radio and in newsprint. (For over a decade, she served as hypnotherapist at George Washington University’s Center for Integrative Medicine in Washington, D.C.) Her most recent book is Celebrity Past-Life Clues: A Closer Look into the Past Lives of 50 Famous People. This remarkable book, heavily influenced by the Seth material by Jane Roberts, is a must-read for anyone with an interest in the concept of past lives and their influence on the current existence. With a Harvard Ph.D. and other impressive degrees and certificates, including a specialization in Spiritual Hypnotherapy, Dr. Joseph Mancini Jr. has become a unique explorer into the past lives—and the implications of those lives—of many people. In crystalizing the concept through his own knowledge and the expertise of twelve practitioners whom he interviewed as host of a very popular radio show, Joe opens our own insights to a spectacular degree. This book is one-of-a-kind and not to be missed! –Lynda Madden Dahl is Co-Founder of Seth Network International and author of eight, Seth-based books, including her Living a Safe Universe series. Dr. Joe Mancini, Jr. takes the reader on a very interesting journey into not only past-life regression, but also, among other topics, Soul Contracts, Children’s Past Lives, Life-Between-Lives, Edgar Cayce’s Atlantis—all glossed through the perspectives of the Seth teachings. His book is a fascinating blend of interviews, case histories and even helpful hints about experiencing a past-life regression. Those new to metaphysics and professionals alike will benefit from this material. –Katherine Zimmerman is an internationally known author and speaker, Certified Clinical Hypnotherapist, Reiki Master, and EFT Practitioner. She is the Director of the California Hypnotherapy Academy, a former guest lecturer for the University of California Medical Center, Davis and a conference presenter. Through interviews with experts in the field, Dr. Joe explores a fascinating array of topics related to past-life research and past-life regression therapy, ranging from natal regression to the Interlife to the true meaning of Karma. Encompassing both personal accounts and professional perspectives, Dr. Joe delivers the equivalent of a full-length course in a single volume. Best of all, Dr. Joe locates these conversations within the framework of Seth’s teachings on the nature of reality. In so doing, he makes a substantive contribution to the body of secondary writings that support and extend the Seth Material. For any reader new to metaphysics, Dr. Joe Mancini, Jr. has done an excellent job focusing on a number of intriguing topics within spiritual counseling, hypnotherapy and past-life regression. Using the Seth Material and Past Lives as a helpful lens, Joe interviews experts who discuss important areas that do not typically receive a great deal of visibility. Topics include, among others, Soul Contracts, Attached Entities, Natal Regressions, Shamanic Journeying, Edgar Cayce and Atlantis, and Life Between Lives. Plus he offers a helpful discussion about the research into the positive benefits that can come from exploring one’s Past Lives. I heartily recommend this book to those who are eager to learn more about these fascinating topics. —Peter Wright is a Santa Barbara-based, Board-Certified, Past-Life Regression Therapist with 24 years of experience in this field. 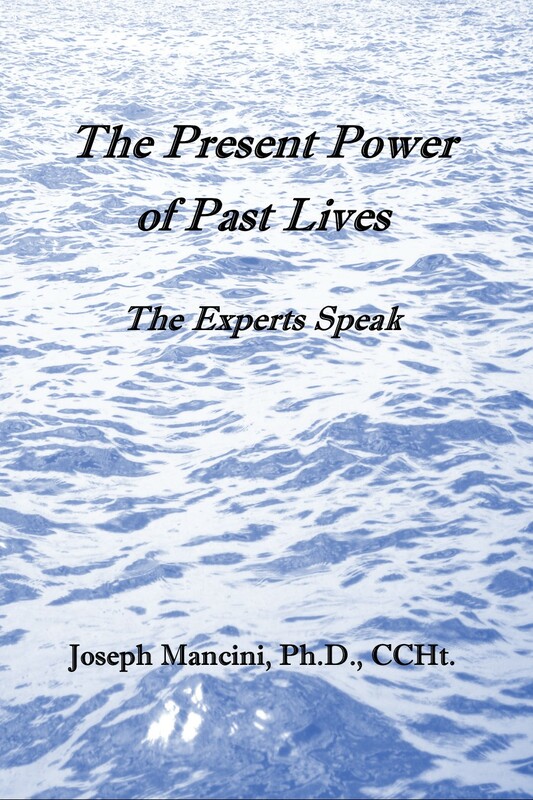 I’m delighted and honored to review Dr. Joe Mancini’s marvelous achievement, The Present Power of Past Lives—What the Experts Say. Dr. Joe is a modern day “psychic archaeologist,” whose broad talents include his first-rate ability to help people access not only their past lives, but also their future, probable, and parallel lives while under deep hypnosis. We are all multidimensional beings; and, indeed, Dr. Joe’s subjects reveal a rich tapestry of vivid, past-life experiences, many of which allow the regressed the opportunity to explore their own inner landscape and permit the regressionist, Dr. Joe, the opportunity to balance their inner and outer spiritual needs as necessary. Dr. Joe’s work offers unique insights into consciousness explorations via various hypnotherapy modalities as accepted means of assisting people who wish to explore their “past.” I feel that we owe Dr. Joe a debt of gratitude for bringing us, with the help of other experts he interviews, to the cutting edge of this exciting field. Go Joe! –Ron Card is a retired photojournalist and a Seth presenter and practitioner who has read and applied the principals and philosophy of the Seth Material for over forty years. As a practicing, certified, clinical hypnotherapist who specializes in past-life regression, I found Joe’s book not only insightful, but also compelling and greatly enjoyable. Dr. Joe’s book lovingly furthers the conversation on reincarnation and the very real potentials for healing and learning in the present lifetime by including a wealth of perspectives from first-person experiences of past-life regression. The Present Power of Past Lives—What the Experts Say is accessible and coherent, and is presented in a practical format, which is of use to both the clinician as well as lay explorers of consciousness. Joseph Mancini’s new book is an exciting array of eclectic therapeutic disciplines. Comprising a broad selection of inspiring, thought-provoking information, this book appeals to a broad, avid readership for both the curious professional and the spiritually-oriented reader. Using the “Seth” material and past-life regression as the focal point, The Present Power… introduces some of “the worlds beyond our ordinary space-time reality,” e.g., prenatal regression, earth-bound entities, between-lives material, soul contracts and group reincarnation. Shared in the format of radio interviews, the amassed information is easily understood and has a nice flow. Curious professionals can glean a number of valuable techniques for expanded exploration. This book contains also an excellent section of clarifying notes interspersed with Seth material, as well as the therapeutic perspectives, beliefs, and findings of those professionals interviewed. Mancini’s book is a most welcome edition to the expanding field of transpersonal regression therapy. This book is one man’s journey through the fields and valleys of his intellect and intuition with the Seth material and his Self as his guides—as he explores the minds he meets and tries to answer metaphysical, psychological and practical questions for himself and all of us, questions concerning how the existence of simultaneous time and past and future lives expand our present awareness and identities, and greatly impact our present experiences. –Barrie Gellis is a teacher, poet and one of the original New York Boys in Jane Roberts’ Elmira ESP Seth Classes in the 1970s. Among Barrie’s 4,000 poems is the poetry book, Outside Is A Secret Key.